We are always being asked for gold price charts. In an attempt to provide helpful and useful information, we have prepared the table below and corresponding graph opposite. 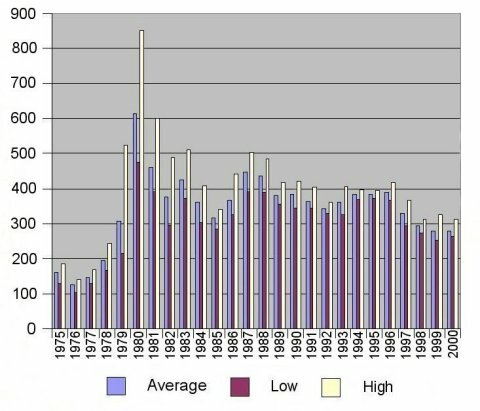 These show highest, lowest and average monthly London gold bullion fix prices from 1975 to 2000. All prices shown are in US Dollars per ounce troy. We are sorry we do not have a similar chart currently available in pounds sterling or any other currency. A daily gold price chart is available on the website of the London Bullion Market Association. We now provide live gold prices, please see our Live Gold Prices page.